Bourboulenc is a popular white wine grape varietal which is used mostly in the production Chateauneuf du Pape Blanc. 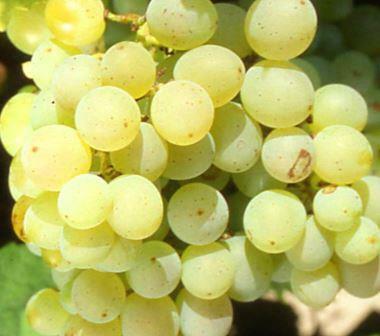 The grape has long history for use in making white wine. When it was first used, it was known under the name of Asprokondoura in ancient Greece. Interestingly, wine historians are now concluding the grape was first cultivated in the Rhone Valley and is related to another popular white wine grape, Clairette. Aside from its use in Chateauneuf du Pape as a blending grape in their white wine, Bourboulenc is also planted in other areas of the Southern Rhone Valley including in the Languedoc and Minervois appellations. The grape is also planted in Provence, Lirac, Tavel, Luberon, Ventoux, Costieres de Nimes and the Vacqueyras appellations. Bourboulenc grows best in limestone soils and a warm, dry climate, allowing it to achieve the correct level of ripeness and maturity. Bourboulenc, a high yielding grape, which ripens late and requires a lot of warmth and sun to mature, adds strong citrus, floral and herbal characteristics to the wine along with freshness, due to its high acid and low alcohol personality. Most of the time, Bourboulenc is used as a blending grape and is often paired with Roussanne and Grenache Blanc. However, that is not always the case. The vines for Bourboulenc can get quite old, if they are planted in the right terroir. For example, at Domaine de la Solitude in Chateauneuf du Pape, they have vines that are prized as they are over 100 years of age! There are producers that make wine from 100% Bourboulenc, for example, Chateau Rouquette Sur Mer Blanc and Chateau d’Angeles, which both make wine in the La Clape region of the Languedoc. This specific wine was singled out because it’s owned by Eric Fabre. Eric Fabre was the previous technical director at Chateau Lafite Rothschild in Bordeaux. Chapoutier also produced a wine from the Cotes du Rhone with a large percentage of Bourboulenc in the blend. Wines made from high percentages of Bourboulenc are best drunk in their youth. The grape is prone to oxidation if aged too long. Bourboulenc, due to its unique, fresh, citrus characteristics is best paired with different types of seafood and shellfish. It’s also a perfect match for the famous dish of southern France, bouillabaisse.